Crisis smisis is what London-based Marazzi design must have thought when they designed this kitchen. It’s made of 24 carat gold leaf and Venetian glass and has Crocodile leather cabinet doors and Swarovski crystal lights to boast. 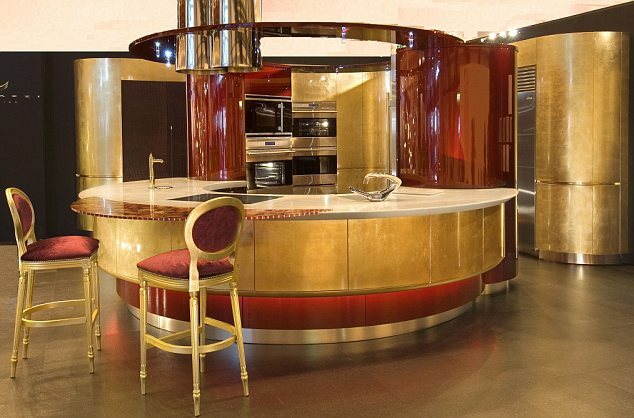 It’s claim to fame is that it’s believed to be the most expensive kitchen in the world. Somehow I bet an Indian Mogul or Arab oil magnate somewhere would beg to differ, but it sure looks expensive! This entry was posted in Design, designers and online finds, Homes of the rich and famous and tagged 24 carat gold, Crocodile Leather, Marazzi Design, Most expensive kitchen, world's most expensive. Bookmark the permalink. Call me crazy, but I was ready to hate this, and I quite like it!